We were passing through Portland last weekend and decided to make a quick detour to Forest Avenue for lunch at the Fishermen's Grill. 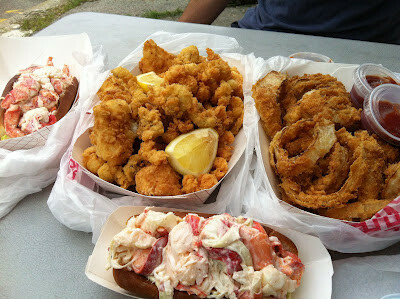 We knew were were going to have two 'classic' lobster rolls but decided to ask what was going into the frier that day. turns out just about everything. According to the owner, the clams had just been shucked, the haddock just cut, and the scallops just off the boats (the shrimp we were told were 'processed' - appreciated the honest answer). We decided on a mixed basket "sampler" and a large order of onion rings. After a little bit of wait, the baskets came out - piping hot and all of the fish was super fresh. While we might have over ordered (certainly we didn't need the 'large basket of rings), the detour was well worth it.